October 17 and 18, 2009, Folsom City Lions Park will be transformed to a delightful Elizabethan town filled with myriad characters and vignettes resembling those of Shakespeare's most beloved plays. In addition, over 900 costumed entertainers and hundreds of shopkeepers and artisans will add to the ambience of the Faire. There is no better place to shop for the holidays! The event will boast three stages filled with entertainment consisting of dancers, sword fighters, magic shows, bard tales, music aplenty. Play games, enjoy the most delicious foods and beverage! FANTASTIC!!! The Knights of Avalon, a nationally acclaimed full contact jousting troupe. NEW!!!! Gypsy Realm Productions - With laughter and flare Gypsy Realm productions proudly presents some of the best beloved fairy tales of all times. Performed with marionettes and live performer's, You will laugh, cry and maybe even sing along with these unique and eventful players as they bring you the tales of Rapunzel, Little Red Riding Hood and Rumpistilskin. NEW!!!! Zinger’s Royal Magick - Thinking adults (who comfortably bring their children) entertainingly discover "everything at this faire is real and everything is not real" when half a dozen talented performers and surprise guest artists present "Royal Magick's New Worlds Tour ... continued." Trey Cromwell, Professional Showoff, a one man danger show that combines combining variety arts like juggling, contortion and escape artistry into a seamless whole. The Merry Praynksters, a country dancing group, will whirl and wind among the patrons with their period dancing while Danse Macabre will progress through the streets enthralled in their dance with death their hunting music and attire leaving patrons in awe. Folsom Renaissance Faire has something for everyone. Meet the likes of royals and rebels, pirates and peasants, ministers and merchants! Artisans and crafters will give demonstrations and lectures throughout each day on blacksmithing, weaving, spinning, bow-making, chainmail creating, and much more. Entertainment abounds, courtesy of nationally touring stage acts, musicians, singers, and more. Savory food and drink (including hard spirits for adults and homemade root beer for youngsters) will satisfy your hunger and thirst. Quaint shoppes will provide a bevy of handmade goods to purchase-from jewelry, pottery, clothing, and furniture to swords, toys, and even geodes and lingerie. needed to make sure justice is served! $5 per person ~ No advance registration required. Agecroft Hall ~ 4305 Sulgrave Rd., Richmond, Va.
Irish Festivalis September 12 & 13 AFFORDABLE FUN for EVERYONE! The Pittsburgh Renaissance Festival, which opened on Aug. 29, experienced its second week in a row of record-breaking crowds. “We offer a great and affordable way to have some fun, and people are returning to see the outstanding entertainment and arts we have to offer,” said Jim Paradise Sr., president and owner of Rocky Mountain Festivals, Inc. and organizer of the event. “We really believe that this is a great market for a Renaissance Festival and the people of Pittsburgh and the surrounding area are proving us right." The Festival will celebrate the “Luck O' the Irish” during Irish Festivalis Weekend on Sept. 12 and Sept. 13 with Irish dancing, lively music and food selections from the Emerald Isle. Share a “Bit O' the Blarney” with their Majesties King Henry and Queen Anne this most joyous weekend and enjoy fyne Irish songs, good beer and good cheers. In appreciation of our servicemen and women, all military personnel will receive special discounts at the gate this weekend by showing a military identification card. The discount includes a “Buy One, Get One Free" ticket as well as free admission for children age 12 and under. Remaining themed weekends include Wine Revelry (Sept. 19-20); Celtic Fling (Sept. 26-27); and Oktoberfest: A Final Huzzah! (Oct. 3-4). During Wine Revelry, patrons can enjoy free sampling of vintages from local Pennsylvania wineries. The Pittsburgh Renaissance Festival and Artisan’s Marketplace is a medieval amusement park offering affordable fun for everyone, fantasy and adventure and featuring combat jousting, games of skill, authentically costumed performers providing continuous entertainment, food and drink fit for a King, and over 100 master artisans exhibiting fine arts and crafts. The Festival is located in the Laurel Highlands area, just southeast of Pittsburgh off I-70, Exit 51A, Route 31 East. Shakespeare and Friends is a recreation of a festival in the late 1500's in Scotland. Attending will be Queen Elizabeth I, King James and Sir William Shakespeare. Featured entertainers are MacAlum Celtic Band, Johnny Phoenix the fire breather, The Nickel Shakespeare Girls, The Lords of Chivalry full armored joust, Puppetry, Demonstrations, Marketplace, Children's activities and games. June 6-7, 2009 in Crockett Spring Park in Historic Rogersville, TN. Thousands of patrons will once again descend onto the Valhalla Renaissance Faire at South Lake Tahoe's Camp Richardson in a celebration of the adventure, romance, merriment, and magic of 16th century life in what has turned out to be one of the most beloved events of its kind in California. This year the Faire will be celebrating its 17th year. Festival goers are entertained all along the paths and roads that wind their way through the Renaissance Village. Jugglers, minstrels and fortunetellers and more interact and play to the passersby, who peruse through over 25 guild yards and 100-plus merchants and artisan's shops of the Market Village. There is shopping galore: patrons will choose from high-quality handmade one of a kind crafts like pottery, jewelry, toys to swords, leather and metal works, and wood carvings. In many cases these creations will be demonstrated before your eyes. The hundreds of festival performers, adorned in 16th century attire and speaking the Queen's English, provide color and detail to a Renaissance village that looks to have stepped from the pages of history. Four stages with live music, story telling, dancing, comedy and magic acts keep the patrons entertained with variety acts. Mead aplenty flows during the festival, so does a wide selection of beer and wine. It all gets underway this year May 30th and 31st and June 6th and 7th, and once again each weekend of the event is highlighted with its own theme. Overall the festival theme is one of great celebration, where all of Europe has come to pay homage and to celebrate Her Majesty the Queen Elizabeth. Also, a rising young star of London's theatre scene, Will Shakespeare, faces a scourge like no other: a paralyzing bout of writer's block. While the great Elizabethan age of entertainment unfolds around him. Will is without inspiration on material. What Will needs is a muse--and in an extraordinary town whilst on progress with Her Most Royal Majesty, Queen Elizabeth, he finds himself surrounded by numerous quirky characters who draw him into an amazing, dramatic adventure of action and love. Their stories make their way into his plays and into our hearts. This year's theme for the Valhalla Renaissance Faire is Shakespeare's Muse. Highland Shindig! - First Weekend Don your kilt and be part of the Scottish invasion the first weekend of Tahoe. Highlight of the weekend will be a series of Celtic Rock concerts featuring pipes and drums of the nationally acclaimed band, TARTANIC (http://www.tartanic.com). TARTANIC is a band on the edge that fills a much-needed niche in Celtic music performance, taking tunes out of the session and into the sensational with their own brand of humor and theatrics. This is not just music...this is an interactive spectacle brought to you by...TARTANIC cannot be held back as they take live performance to heart and create a high-energy pulse at 120 beats per minute and beyond. Celtic music from Scotland, Brittany and original contemporary compositions is melded with rhythms from around the world and propelled into the musical world of the future. Mixing the time-honored traditions of the Great Highland Bagpipes with a bevy of drums featuring world percussion from Arabia, Africa and America, TARTANIC has produced a musical fusion which is nothing short of EXPLOSIVE. TARTANIC will be joined on stage by another explosive act, the Nine-8ths Irish (http://www.nine8thsirish.com), a high- energy band from Sacramento, California. The band Nine- 8ths Irish has received a lot of attention within the traditional Irish music community since forming at the beginning of 2007. The all-instrumental quartet describes its style of music as "Irish and a wee bit more," the wee bit coming from the bluegrass, old-time country music and jazz the band members had played before coming together to pursue their shared love of traditional Irish music. Pirate Invasion! - Second Weekend Set sail for a swashbuckling weekend and invade our shire with your piratical shenanigans. Participate in Scavenger Hunt, tour the deck full sized deck of a tall ship, the Dauntless, quench yer thirst and sing a song with Sea dogs, join adventures of the Irish Pirate Queen Grace O'Malley as she comes to England. Participate in the Talk Like a Pirate Contest! Second weekend will also feature Knights of Avalon. Knights of Avalon offer the most authentic, exciting and entertaining full contact Jousting show. Combining the elements of spontaneity, action, and humor, the Knights of Avalon present a show that will keep audiences enthralled and coming back for more. Check out what the talk about towns is all about!!! 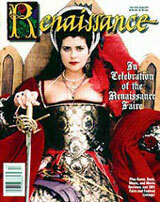 The Renaissance Festival will be held May 30th and 31st and June 6th and 7th. ….The Washington Renaissance Fantasy Faire is returning to Pierce County and has a new owner. The 2009 Faire will be held the first three weekends in August…The Washington Renaissance Fantasy Faire is now owned by Bill Watters of San Francisco. Watters puts on other renaissance events around the country. Ron Cleveland, founder of the Washington Renaissance Faire, is now the event's operational manager. The long-running theatrical event's founder, Ron Cleveland of Gig Harbor, said Wednesday he lost everything — including the fair itself — when he ran into trouble trying to move it from Purdy to leased Pope Resources land off Old Belfair Highway. Neighbors protested that traffic and noise would be a problem and Mason County commissioners didn't act to approve it based on a Department of Natural Resources moratorium against new use permits for the site. DNR said Cleveland illegally logged part of the 206 acres. Laguna Beach Chamber of Commerce celebrates the Pageant of the Masters’ “The Muse” with a Renaissance Faire on Monday, July 6, 2009 and celebrates the opening of the Pageant of the Masters. … Will be open weekends only April 4th– May 17th, at the beautiful, shady, Santa Fe Dam Recreation Area, located in Irwindale, CA. The Renaissance Faire is a lively representation of an English Port Town and Marketplace during the reign of Queen Elizabeth 1. Characters such as Sir Francis Drake, William Shakespeare, Queen Elizabeth and her glittering court, Puritans, Fish Mongers, Privateers, Rogues and Wenches come to life and engage the guests in banter, gossip and spirited play. Over 2,000 brightly costumed performers participate in bringing Merrie Old England to vivid life on the 14 Stages and in the village streets.